Please go through my previous posts on this topic if you are new to this cuisine. Here are some more recipes for Chutneys With lentils...We have to use, de-husked (cleaned), split lentils for this and not the whole one. 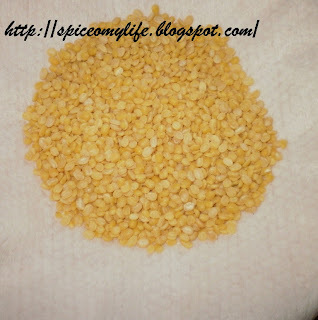 Split and de-husked Green Gram is known as Moong Daal in Hindi and Pesara Pappu in Telugu. 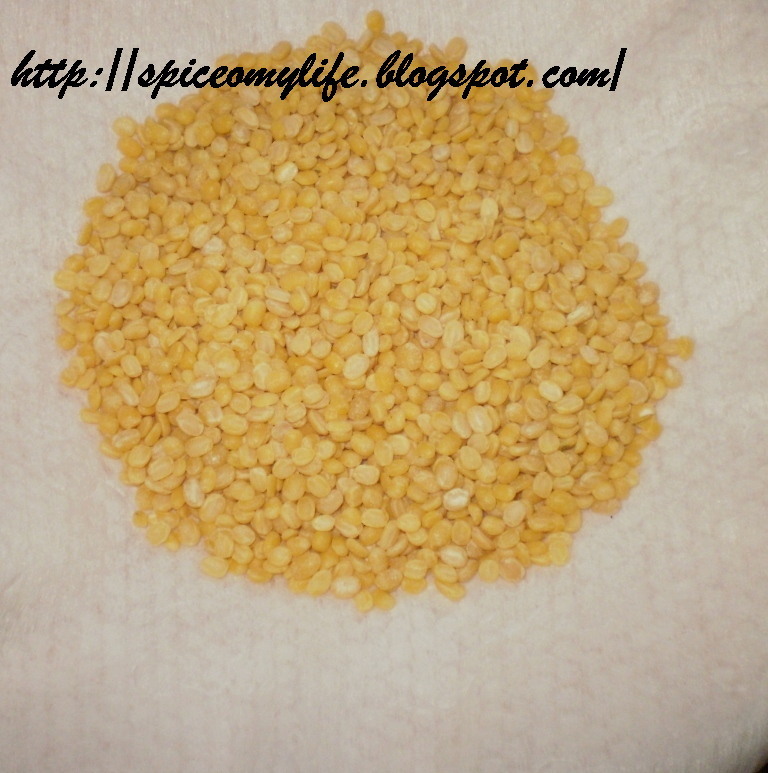 Heat ghee or oil in a pan and roast the lentil until it gives of a nice roasted smell. Cool it. Roast dried chillies just for a minute and keep aside. Peel and slightly roast the garlic. Take all the ingredients and grind to a paste by adding water little at a time. Adjust the quantity of the Red Chillies as this will be very spicy for those who are not used to eating spicy food. The consistency of the chutney should be a very thick paste if used as an accompaniment to rice and thinner if used with Idly Upma or Dosa. Garlic is optional and sugar can be used in place of jaggery. Wash and soak the lentil for 2-3 hours. Usually this lentil gets soaked easily. If not soak it till it is done. Remove the excess water. Take all the ingredients and grind to a paste. Add a little water if required. Heat 1-2 tsp of ghee or oil to a smoking point and lower the heat. Add 1 tsp of mustard seeds. Let them splutter. Now add 1 tsp of cumin, one red chilli broken into pieces(avoid this if you don't like spicy food). Add 1/4th tsp of Asafoetida, curry leaves (two sprigs). Mix it with the chutney and serve garnished with finely chopped coriander greens. These chutneys will have to be consumed within a day. But it is easy to make.